I hope that you will give a listen to my new CD -- IN SEARCH OF AN OASIS. It is available for auditioning and purchasing online at CD Baby. Or E-mail me at ralphkozi@comcast.net. "The awesome CD produced by Ralph Koziarski," said Lyn Watson, President of The International Myomassethic Federation. The following are from my project entitled On My Own. It is a collection of Jazz standards and a couple of originals. The following selections are representative of sets that I perform at clubs and private parties. 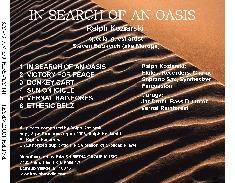 To the left is the cover of IN SEARCH OF AN OASIS. In the photo is my collection of domestic and exotic woodwinds, along with other instruments, that I feature on the CD. IN SEARCH OF AN OASIS is all original instrumental music written with the intent of being a relaxing background groove. Appropriate for massage, meditation, relaxation, for mornings, evenings or anytime you want a mellow world beat groove. It's your soundtrack for imaginary movies. 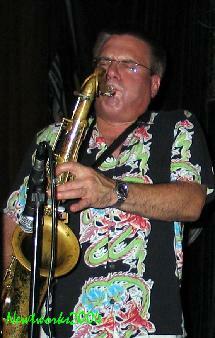 Ralph has been a professional woodwind musician since 1975 performing with numerous jazz, rock and blues groups. In 1985 he was voted "Talent Deserving Wider Recognition" by The Metro Times Music Awards.He has also been a licensed and certified massage therapist since 1982, being voted '"The Best of Detroit" four times by The Metro Times. This CD is his third solo project combining both of his occupations. While his first two CDs, FLUTE SOLOS and FLUTES BELLS & SYNTH. were more ambient in nature, IN SEARCH OF AN OASIS has more of a groove, influenced by his work with Muruga and the Global Village Ceremonial Band. Muruga is a world-renowned drummer-percussionist having played with such greats as Weathereport, Dave Brubeck, Merl Saunders and the Rainforest Band with Jerry Garcia, The Funkadelics and at Woodstock with Tim Harding among others. Steven Bookvich, aka Muruga, is a special guest on this CD performing on the cut Vernal Rainforest. This cut is an environmental, atmospheric groove, alternating between measures of 5 and 7. Other fine musicians on this CD are Craig Michales Hernandez on guitar and John Sase on bass and synthesizer. John also engineered and helped produce this CD as the Kavish Media Group. On this CD, Ralph composed and performed on all of the tracks using a Korg O1W/FD for the bed tracks, bass, and some percussion. Then he overdubbed hand percussion and all of the woodwind tracks. Listen and enjoy. Blessngs! Friday 4/22 I’ll be performing with the Spaceband for an Earthday show called “Resonating Earth Music Festival” at The Universe Bldg. 1 Montana St. & John R between 6 & 7 mile roads in Detroit. An Avant Garde show with Spaceband going on 2nd about 9:30. Sunday 4/24 The Luddites will be at The Rustbelt flea mkt. at Woodward and 9 mile in Ferndale 4 - 5:30, no cover, family friendly. Coming: Saturday 4/30 The Luddites will be at PJ’s Lager House along with All Seeing Eye, 1254 Michigan Ave. east of Trumbull in Detroit. Originally published December 14 2005 in The Birmingham/ Bloomfield Eagle and Gazette. Also December 21 2005 in The West Bloomfield Beacon. Ralph Koziarski, of West Bloomfield, was born with natural rhythm. He was the type of kid who could never stop tapping his pencil on his desk at school, and he knew he wanted to go into music from his early days. Now an acclaimed jazz artist and a certified massage therapist, Koziarski, said he owes it all to his hands. “My hands work for me,” said Koziarski, who is known for his hand percussion and woodwind skills, one-man-band style of jazz music, and his deep, therapeutic massages. Koziarski has been a professional woodwind musician since 1975 and has released three CDs. He has practiced massage therapy since 1982 and was voted “Best of Detroit” for massage therapy four times in the Metro Times and also named “Talent Deserving Wider Recognition” for his music. When Koziarski was 8, he asked his parents the dreaded question of whether he could play the drums. The school band teacher advised Koziarski that the band needed more clarinets. Though he wasn’t “all that inspired” by the clarinet, he did realize he had a natural ability for music and he continued to play various instruments through school and while attending college at Wayne State University. “I realized I wanted to play popular music, like rock and jazz and stuff like that, [and] they weren’t really teaching that at Wayne State then,” Koziarski said. He eventually left school, got married and soon began practicing his two passions — music and massage — professionally. 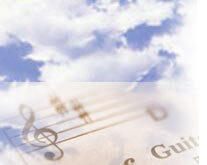 “Different music creates different moods and feels … This is more just relaxing. A number of people say that they find it to be nice in the morning,” he said. Donna Terek, of Detroit, is one of Koziarski’s massage clients and has known him for about 15 years. She said she listens to the CD during her massages. “It’s extremely mellow and relaxing and puts you in a sort of meditative space,” Terek said. A photographer, Terek said she has had shoulder pain from frequently carrying heavy camera bags, and Koziarski was the only person who could correctly identity and treat her problem. “He is the most fabulous massage therapist,” said Terek. She and her husband have also enjoyed seeing him play music many times and in various settings, she said. In his spare time, Koziarski enjoys spending time with his daughter, father and friends. Both music and massage provide Koziarski the opportunity to do what he loves — bring enjoyment to others. “It’s like with both of my professions, you’re giving the people pleasure and something that they enjoy. People enjoy hearing music; you’re creating a fun atmosphere, and maybe creating a party in music. And I enjoy doing massage because I see it’s helping people and it’s making them feel better,” he said. Koziarski will perform with The Ghost Band Dec. 17 at the Cass Café and with the Luddites Dec. 23 at the Cadieux Café. 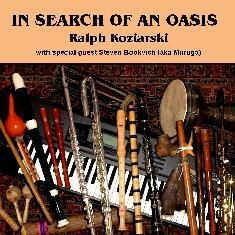 For more information on Koziarski, visit his Web site at www.kozimusic.com or e-mail him at RalphKozi@comcast.net.